We only had two nights in Rome, so that meant only the one full day to cram in the sights. 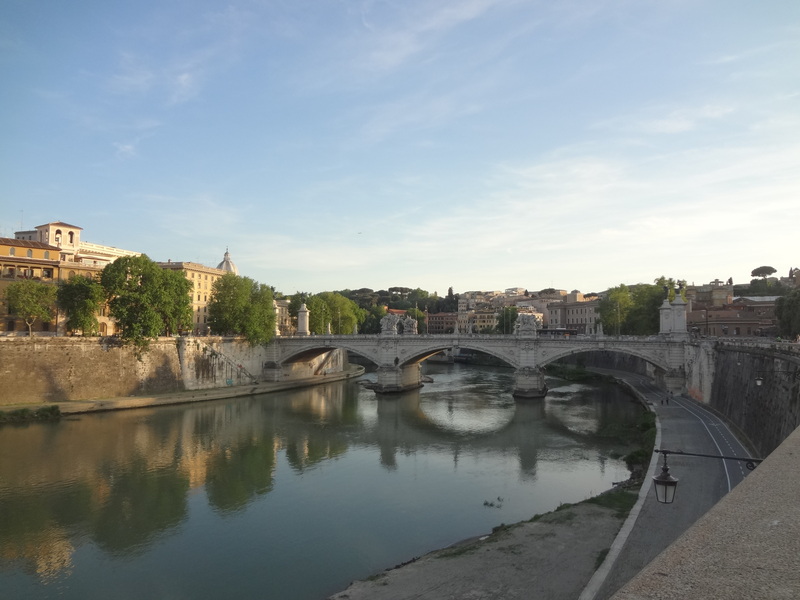 Our hotel was only a ten minute walk from the Vatican so we were able to check that out on the day we arrived, as well as Castel Sant’Angelo. Both of these sights have a great architectural presence and so much history to them. St Peter’s Basilica in the Vatican was built in the 16th century and Sant’Angelo is the mausoleum of the 2nd century Roman Emperor Hadrian. As our time was limited we decided to go on the city sightseeing bus. It cost €20 each, which we saw as quite steep, even if we could hop on and off it all day. Things didn’t go to plan so although the whole bus tour of the city should have taken about an hour, we had only made it to the third stop after an hour and a half of Rome’s heavy traffic and chaos. We were also stuck at the Terminal stop for a long time because tourists kept trying to get on the bus when they didn’t have tickets and there appeared to be a lot of confusion about everything and anything. 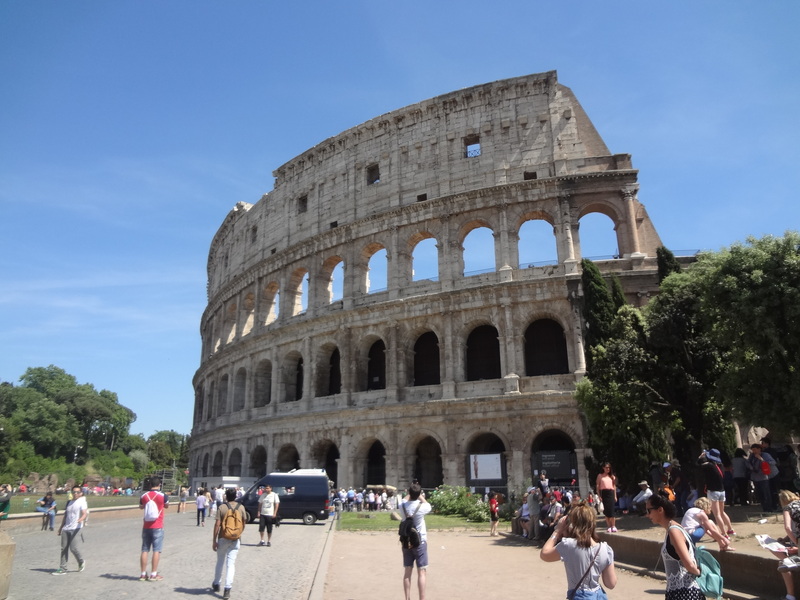 By the time we reached the Colosseum it was lunchtime and we needed food before taking in the sights. We found a restaurant across the busy road from the Colosseum and shared a pizza to save on cost. Afterwards we grabbed a drink from a shop close by and headed to the Roman Forum. 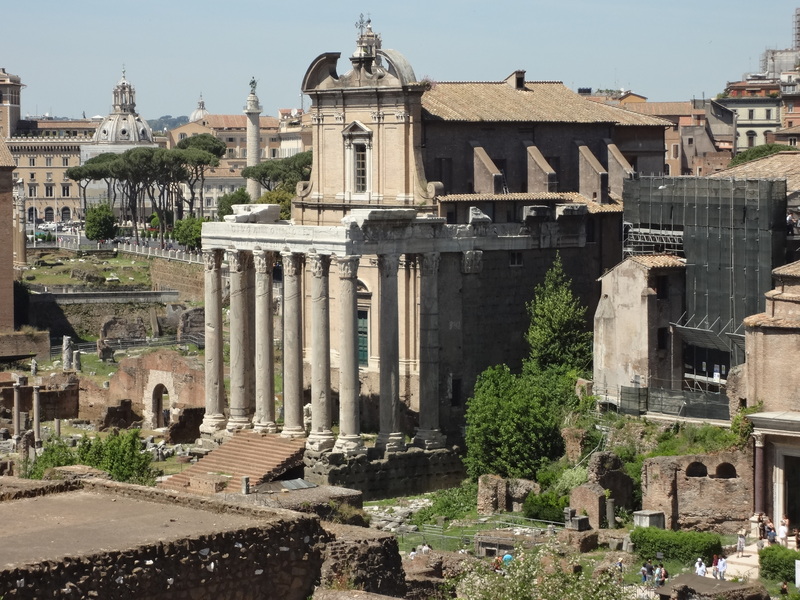 We bought joint tickets for the Roman Forum, Palatine Hill, and the Colosseum for €12 each. It had changed since I last visited back in 2007, there is now a ticket office next to the Forum and the pricing system had changed, so you have to buy a combined ticket and can no longer pay for entry to individual sites. It was early afternoon and the sun was uncomfortably hot, so we tried to stick to the shade as much as possible while exploring the wonderful ancient ruins of a once great empire. I loved soaking up the history, from the ancient temples to the commemorative arches and mausoleums. If you like your history it’s possible to spend hours around here, especially with the Colosseum included in the ticket. A whole day can just be spent in this small area of Rome. Because time had gotten away from us we only had a quick look inside the Colosseum. I have been round it before and the wife was hot and tired by this point, so a quick viewing was all we had chance for. She also preferred the view from the outside. But I loved the staircases, walls, arches and walking out into the arena and almost feeling what it must have been like 2000 years ago for Romans when the mammoth building was in it’s prime. We hopped back on the sightseeing bus, quickly passed by the Circus Maximus and headed back towards the Vatican. When we got off we bought ourselves a gelato, the best in all of Italy! Mine was a mix of mango and forest fruits, its was bloody scrumptious. By this point it was getting dark and there was a great atmosphere through the narrow cobbled streets leading to the Pantheon. It really was a great sight in darkness, lit up only by the odd street light. 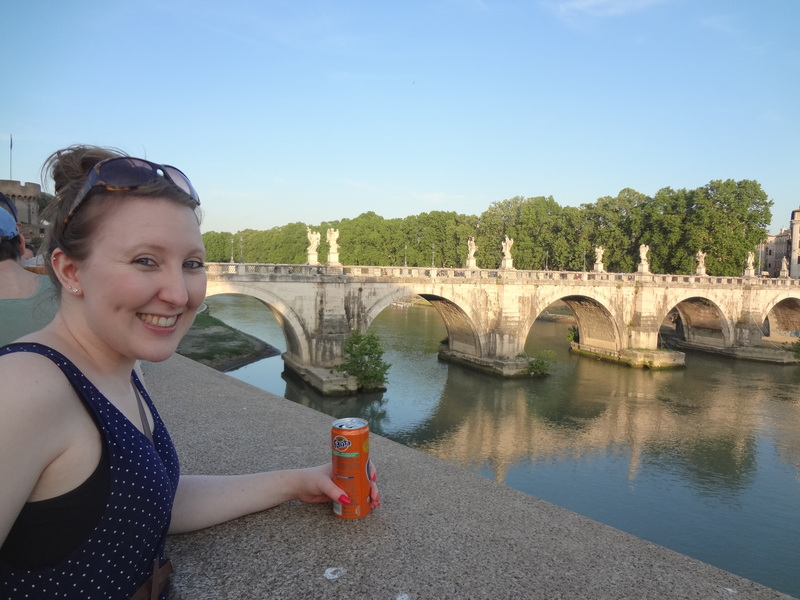 We carried on our walk through the atmospheric streets, cutting through the beautiful Piazza Navona Square, trying to avoid the sellers trying to pressure us into buying selfie sticks and ended up on a bridge which lead to Castel Sant’Angelo. There were plenty of people taking advantage of the great photo opportunities, including us once the Vatican came into view. 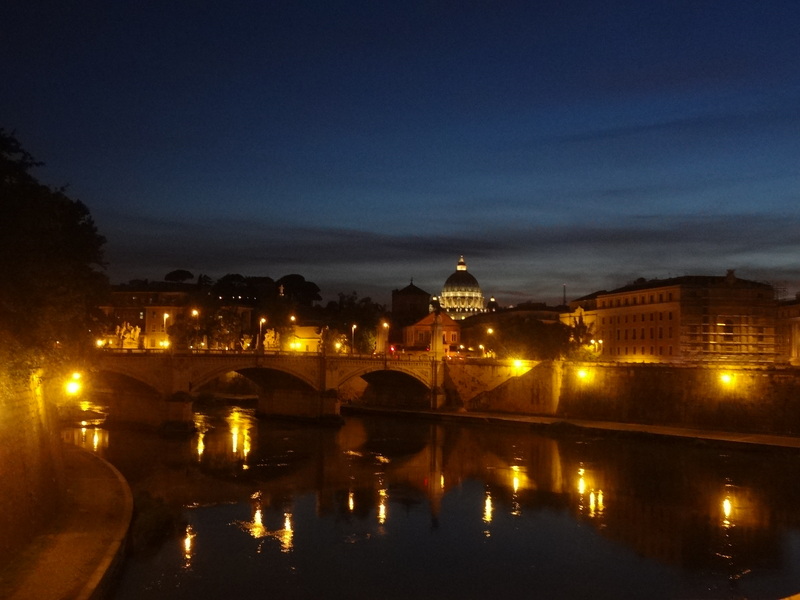 Rome is more relaxed once the sun goes down and is arguably more beautiful with the lights shining on the buildings creating a romantic atmosphere. I recommend having at least a couple of days here to have a chance to explore this great city at a more relaxed pace, as it is hard work trying to see all the sights in one day and can end up being rather stressful.